Technology advancement is of a specific characteristic in our global economy, and with globalization, all sectors have advanced their systems to match the growing demand. Hotel and Restaurant industry is one of the paramount contributors of service in the world’s Hospitality and Tourism sector. This article focuses on the development of systems on helping in customers value addition by effective and efficient delivery of the following: Reservation management, Event management, Guest database, Waitlist management, Marketing, and point-of-sale. All these will add customers’ satisfaction and therefore image brand for the restaurant. Customers enjoy the most convenient and luxurious customer experience, and with the current technology in restaurants, a customer will do reservation anywhere anytime 24/7 a year. The online reservation system through phones, tablets, and other social media accounts is of benefit to both the restaurant and to the customers. When properly managed, it facilitates segregation of duties where a staff concentrates on online communication with the customers while the host deals with the calls. Online reservation reduces the misunderstanding the customers might have with the employee during the calls as all system calls are standardized. Reservation system when accurately designed, developed, installed and maintained, it will be able to detect and prevent double and overbooking by customers. This is because the system should have random numbers for organization resources like rooms. Once the room is booked, the system should allocate another number to the subsequent customer and if the rooms are over the customer should be made aware, and the reservation for the respective customer canceled. When a customer decides to cancel a reservation already made, the system should be programmed to give up to date availability of resources and the room should be automatically relocated for the ticket. The system will inform the customers on the availability and reduces the time spent on serving non-beneficial clients and focusing on the potential ones. Reallocation will enable the restaurant to fully utilize its resources by eliminating the opportunity loss that would have occurred were it not for the system. Integration of Guest database and restaurant reservation systems like Eat App helps the loyal and frequent guest as their details are already in the database. The customer needs only to identify time and room for reservation. This makes it convenient and faster for the customer to make the reservation as others get irritated when asked for the same information every now and again when they visit the restaurant. In addition to the above, the database also enables the customer's information such as preferred customer service staff, personal dishes preferences, timing and occasions such as anniversaries and birthdays. These allow the provision of consistent, customized services no matter the staff and location of the restaurant the customer is served. This when learned by a customer, he/she will develop a positive perception of restaurant hence entity image brand. Point-of-Sale (POS) is very significant to streamlining inventory and order delivery with the data it process. POS also offers full menu customization where a customer may choose those days with preferred menus. The restaurant management can update their online platform with their preferred list indicating the price and any discount available for selected dishes. The administration may decide to entice customers by putting the most delicious dishes adding their images and description to the menu dishes. When the POS menu coincides with the customer, they usually think that the list is customized to them. POS system when integrated with the Guest Database provides crucial information that can be used as data for the restaurant analysis. The data can help the management to know and understand their top guest and the entire list hence enabling the management to extract their VIPs promote and reward them as the marketing strategy. Besides this, the management will understand the geographical consumption order, trends and menu preferences. This forms the basis of planning to a restaurant. Event management is made easier by integration of the restaurant systems of customers’ database and the entity resources in terms of floor area and type and number of seats. Most clients have preferences to specific room layout and seat arrangement. When this is stored and the client books with the same amount of people then it will not take the staff longer time to arrange according to the customer's customization. Room layout and arrangements motivate the client and will be willing to conduct all his or her events in the same restaurant as the services provided are blinding not to see and consider others. 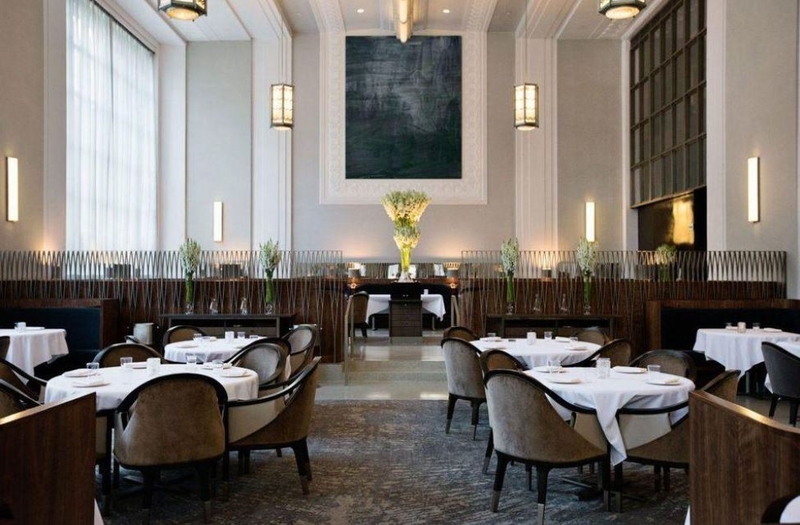 Below is an excellent example of a room layout for an event for a group from Eleven Madison Park. In conclusion, technology innovation impacts so much in the modern economy. Without adopting the current technology by industry like restaurants industry, it is feted for failure. Restaurant reservation, Database, Event Management, Marketing, and Point-of-Sale systems are installed to ensure customers are served adequately and there is value created by helping them. All these enable restaurants to attract and retain their customers hence building their brand image not only through their products but also to the services which form the first contact between a restaurant and the client. Poor initial customer service leads to negative perception leading to lost business.